TELOGEN EFFLUVIUM IS SIMPLY A SUDDEN, TEMPORARY HAIR LOSS CAUSED BY PHYSICAL OR EMOTIONAL TRAUMA. Sometimes your body and mind cannot adjust quickly enough to what is happening in your life and normal systems, such as eating, sleeping and even the hair growth cycle, can get interrupted. When this happens, hair follicles can get stuck in the telogen phase and stop growing (hence, the term “telogen effluvium”), leading to the exogen phase, in which hairs fall out. When the cycle is interrupted, the hair follicle fails to begin a new anagen, or growth, phase again, so hair loss and thinning become noticeable suddenly. But dermatologists say that telogen effluvium is actually the second-most-common form of any hair loss (behind androgenetic alopecia — male and female pattern baldness). It is is your body’s normal reaction to traumatic events, whether physical or emotional, that are going on in your life. Could telogen effluvium be the cause of your hair loss? Did your hair loss happen suddenly? Did you lose noticeable amounts of hair all over your head? Did you recently suffer from a physical trauma, such as a severe car accident? Did you recently have a baby? Are you going through or have you recently gone through menopause? Did you recently suffer an emotional trauma such as a death in the family or a divorce? Have you started a new medication regimen? Are you going through chemotherapy or other cancer treatments? Have you recently had major surgery? There is no way to predict whether any of these experiences will cause hair loss or thinning for you, and there is no medication or other way to prevent it from happening either. These experiences are literally shocking to your body and can disrupt its normal processes and patterns, such as the hair growth cycle in some people. If you have gone through a physical or emotional trauma recently or have experienced any of the normal body changes described above, experts say that regular hair growth will most likely resume within six months or so after the sudden hair loss. For physical traumas, once your body systems normalize, such as after having a baby, follicles return to their normal cycles and begin to grow again. If the cause of your sudden hair loss was medications or chemo, once you discontinue the medication, follicles will return to the normal growth cycle, and with some medications, after the body adjusts, hair will begin to grow normally again. 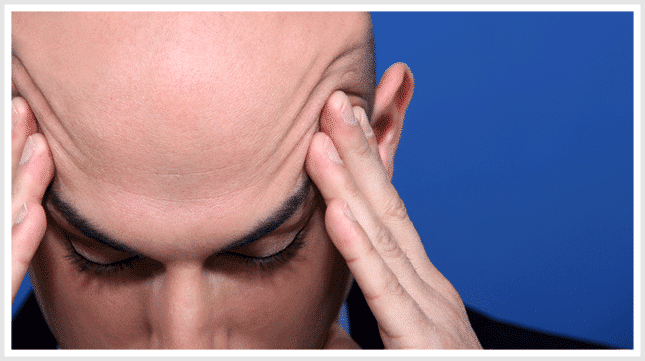 You should definitely visit a dermatologist to be sure that your hair loss is caused by simple telogen effluvium. Once you are over the trauma or life change, you can speed up the hair regrowth process by using medications such as FDA-approved topical minoxidil (brand name Rogaine), which can be purchased over the counter, and laser hair therapy can also kick-start follicles into the growth phase and help hair grow in healthier than it was before. Treat hair and scalp gently during this time, and if you’ve lost a noticeable amount of hair, consider cutting it short or into a new style to minimize thinning, wearing a scarf or wearing a temporary hair replacement or wig. It’s important to check with your dermatologist and doctor for a blood test if you have other symptoms along with the hair loss you noticed, because hair loss can also be caused by a number of genetic, hormonal or medical conditions that require medical treatment.